A strange fever overcame American voters in late 2016. Something that could have only resulted from our blindness to history. Something that makes us rethink the very foundations of our democracy. Something that likely had our activist forebears rolling over in their graves. I am, of course, talking about the completely ludicrous idea that the Federal Bureau of Investigation—a brutally racist organization with a trail of dead bodies and shattered lives in its wake—was somehow a comrade, maybe even a savior, in the war between the people of this country and President Donald Trump. A few weeks ago in “the FBI is not your ally” news, we covered the organization’s war against black independent booksellers in the late 1960s. This week’s installment comes to us from George Joseph and Murtaza Hussain over at the Intercept. One report refers to a specific activist’s itinerary from New York to a protest in Ferguson, Missouri. It also focuses on the money that activists had raised in the event that their fellow marchers needed bailing out of jail. What the reports don’t mention is a credible threat of violence, which in turn makes any report on these activities interpretable as harassment, overreach, or a continuation of COINTELPRO tactics. 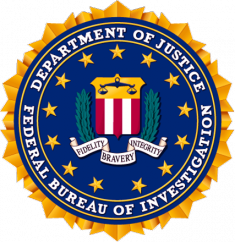 The FBI’s war on black activists is a long history, rife with antagonisms and little-known. What we do know—for instance, that the bureau’s intrusions on Dr. Martin Luther King, Jr.’s life included attempting to blackmail him into suicide—is astounding. 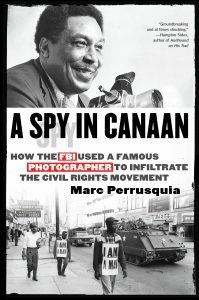 A new, inside look at some of the many lives overturned by COINTELPRO, and other dirty FBI surveillance tactics from the height of the civil rights era, publishes next week: Marc Perrusquia’s A Spy in Canaan. It, too, will add to what we know. And it is a book that could only have been written after decades of research and relentless FOIA requests, like those sought by Color of Change and the Center for Constitutional Rights on behalf of Black Lives Matter activists. So, please, let’s remember who our friends are (journalists and activists) and who they aren’t (the FBI, sheesh).